Every living organism on this planet is built by a set of genes. Genes that people have been influencing (or, if you prefer, ‘encouraging strategic traits’) since Gregor Mendel first discovered them while hybridizing pea plants in the mid nineteenth century. And horses are no different, with preferred characteristics being reinforced with selective breeding through the centuries. Now, for Dr. Samantha Brooks and her team at the Brooks Equine Genetics Lab (a part of the University of Florida Genetics Institute) are taking a closer look at these individual genes, and how increased understanding of those genes interactions can impact the development of horses. They’re working on genomics, or the study of genomes – the function of the genes, how they fit together, and how they’re passed from parent to child. Dr. Brooks hopes that an understanding of the equine genome will help breeders to bring out the best traits, while preventing genetic disorders. Dr. Brooks initially began her research at Cornell University, but moved to the University of Florida in 2014. “Florida has a much larger horse population,” she said. More horses in the area means more potential sample data for Dr. Brooks and her team, and more local parties (such as breeders and ranchers) interested in their findings. For example, research into the genetics of coat color, one of the more marketable traits in horses, could also reveal the causes of certain behavioral traits. Owners of chestnut horses frequently describe them as highly reactive and excitable, which may be related to genetic factors. In humans, red hair is a mutation of the melanocortin receptor 1 (MC1R) gene, which limits the production of black pigmentation in favor of red. This mutation also causes a lowered threshold for pain and a heightened sensitivity to sun in people. A similar mutation is responsible for the chestnut coloration in horses and could indicate that chestnuts are more susceptible to environmental stimuli, leading to a more reactive temperament. Another of Dr. Brooks’ studies which may be of particular interest to breeders examined the genome of Arabian horses, and the risk focus for metabolic syndrome and laminitis. Her team found a genetic marker that correlated with an elevated chance of laminitis. Recognizing this gene in their horses gives breeders and owners a chance to prevent the disease by being more selective in how they feed at-risk horses, such as by limiting carbohydrate intake, which can contribute to laminitis. Knowledge is power, but it can also be a two-edged sword. In 2010, researchers identified a genome in region three that can add nearly three inches of height in Thoroughbreds. However, later studies also discovered this same gene was associated with the respiratory condition known as roaring (recurrent laryngeal neuropathy, or RLN) in Thoroughbred racehorses and in draft horses, as well as osteochondritis dissecans (OCD) in German Warmbloods. Unfortunately, selectively breeding for this increased height gene may have also increased the incidence of these genetic diseases. This is just one of the reasons Dr. Brooks and her team are studying the equine genome. By determining these links with further research, they hope to be able to utilize those desirable traits while minimizing the undesirable. By studying the Quarter Horses and Ranch Horses in the University of Florida breeding pool, Dr. Brooks hopes to identify genetic markers associated with spooking and startling. The experiments involved horses given the same environmental training and were conducted in consistent settings. While the horses ate, a researcher opened a brightly colored umbrella nearby. Their responses were recorded, from tiny ear flicks to full bolting, and then measured the time it took for the horses to settle and resume eating. By comparing the genes of the horses with mild startle reactions to those with extreme reactions, Dr. Brooks and her team hope to build predictive models to formulate the chances of a given horse being “spooky” based on their DNA. 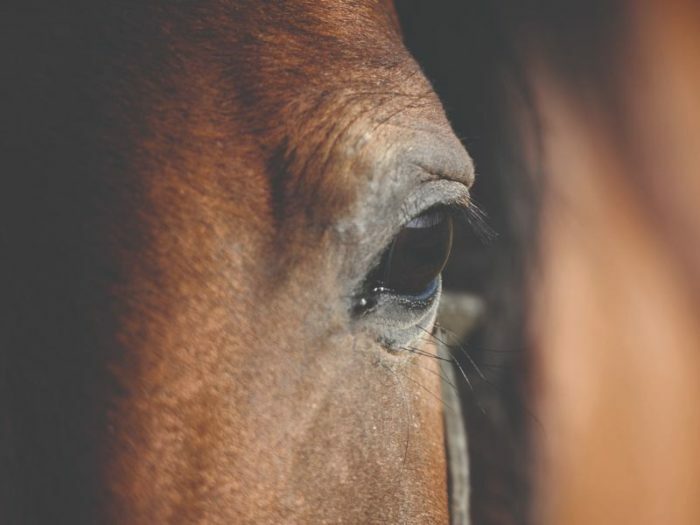 Knowing these and other factors of a horse’s temperament before buying can help a prospective buyer make an informed choice, better targeting horses to careers appropriate for their temperaments. Another current study is looking at anhidrosis, or a compromised ability to sweat. “Especially in a place like Florida, where we use sweat to regulate our internal body temperature for much of the year, this can be a major impact to a horse,” reported Dr. Brooks. “We are looking into different familial connections to this condition.” Discovering a treatment, or even finding a way to prevent anhidrosis in susceptible horses, would be a boon to horse owners nationwide. Of course, Dr. Brooks does not want to focus solely on negative factors, but to track positive factors as well. One of the lab’s newest studies incorporates digital video and photograph analysis, alongside research into a sport horse’s pedigree and performance record to study how genes can enhance the performance of these breeds. As researchers begin to understand more about the genetic factors that influence equine development, they are able to improve not only the lives of generations of horses, but of the humans they work, run, and live alongside – just as they have for generations.